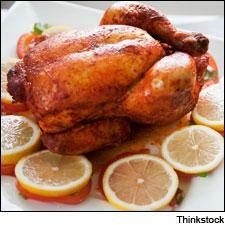 Roast chicken, brined and stuffed with citrus and herbs, pairs well with a range of wines and pleases all palates. It's officially summer for nearly another month, and this year both Rosh Hashana and Yom Kippur, the Jewish High Holidays, will begin and end before the start of fall. Rosh Hashana, the Jewish new year, begins at sundown on Wednesday, Sept. 4, and Yom Kippur, the Day of Atonement, begins at sundown on Friday, Sept. 13. For Eric Kleinman, chef and partner at New York's 'inoteca, the High Holidays are more a busman's holiday, as he is often called upon to prepare some variation of the rustically refined Italian fare he prepares at his downtown restaurant. Here, Kleinman shares his recipe for whole roasted chicken, brined with herbs and spices and stuffed with citrus fruits and red onion, and a homey fregola pasta tossed with kale, dried fruits and pine nuts—perfect for making ahead and serving at room temperature, family-style. A simple salad of late-summer tomatoes and cucumbers, sliced and tossed with olive oil, red wine vinegar and salt should round out the menu, along with the traditional servings of apples, pomegranates and honey. Roast chicken and pasta prove versatile matches with red or white wines, and so we have included tasting notes for a range of recently rated kosher wines from Israel and California whose diversity reflects the ever-growing demand for high-quality in the category. In a large, nonreactive saucepan, combine the thyme, salt, sugar and spices and add 2 1/2 gallons cold water. Bring the mixture to a simmer, stirring intermittently to prevent the salt and sugar from scorching. After simmering for 20 minutes, remove from the heat. Strain and discard the solids. Add 8 cups of of ice cubes to the hot liquid. (You may have to divide the liquid into two containers to avoid overflow.) Once the cubes have melted, submerge the chickens in the brine. Cover and refrigerate for 1 hour. Preheat oven to 350° F. Stuff each chicken with 2 quarters of lemon, orange and onion, plus one bay leaf and one or two sprigs thyme. Rub the outside of each bird with olive oil and season liberally with salt and pepper. Roast the chickens in a shallow pan with a roasting rack in the center of the oven for about 50 minutes to 1 hour, until the leg meat closest to the bone is at 168° F on an instant-read thermometer. Remove the birds from the oven and let rest, loosely covered with aluminum foil, for at least 20 minutes before carving. Serves 8 to 10. 1. Bring a medium pot of heavily salted water to a boil and add the fregola. Cook for about 1 1/2 minutes less than indicated on package, so that fregola is still slightly hard in the center. As the pasta cooks, combine all of the dried fruit in a bowl. Drain the fregola, reserving 2 cups of the cooking liquid. Pour half the cooking liquid over the dried fruit and cover with plastic wrap. Toss the hot fregola in a separate bowl with 1 tablespoon of the olive oil to prevent the pasta from clumping. Transfer the pasta to a sheet tray to cool. 2. In a large sauté pan, away from heat, combine 1/4 cup of the oil, the pine nuts, red pepper flakes and lemon zest. Place the pan over medium-low heat. When the ingredients start to sizzle and the nuts start to lightly brown, add the kale. Sauté for about 2 minutes, stirring to prevent browning. Add the remaining reserved pasta water. Season the mixture with salt and pepper and continue to cook until the kale is tender, then remove from the heat. 3. Toss the fregola and cooked kale together in a large bowl. Season with salt and pepper as needed, and drizzle with the remaining olive oil and lemon juice to taste. Serve at room temperature. Serves 8 to 10. Offers a perfumed, floral aroma, with nicely sculpted flavors of dark currant, plum tart, pomegranate and mocha. Medium-grained tannins give this backbone. Finishes with dark chocolate, raspberry jam and minty overtones. Kosher. Drink now through 2016. 3,000 cases made. —K.M. A sinewy red, with a sanguine caste to the dried red fruit and crushed berry notes. The tea flavors are joined by bittersweet chocolate on the long, supple finish. Kosher. Drink now. 3,000 cases made. —K.M. This offers an interesting mix of sage, sandalwood and wild currant flavors that have notes of raspberry jam and iodine, followed by a long finish of pepper and cardamom. Marselan, Caledoc, Carignane and Pinotage. Kosher. Drink now. 250 cases imported. —K.M. Very crisp, with an almost citric edge to the raspberry, cherry and red currant flavors. Dried basil notes, with sanguine and cast iron midpalate, linger into the finish. Merlot. Kosher. Drink now through 2015. 250 cases imported. —K.M. Bright and juicy, with crisp apple, lemon and melon flavors that are mouthfilling and feature touches of richness. Offers gooseberry notes on the finish. Kosher. Drink now. 600 cases imported. —K.M. Smooth and ripe-tasting, with baked plum and cherry tart flavors that show hints of milk chocolate and cream, with notes of cardamom on the finish. Kosher. Drink now. 700 cases made. —K.M. A medium-bodied, briary red, with raspberry, kirsch and cherry flavors that are accented by cardamom and cream. Offers light chocolate mousse notes on the finish. Kosher. Drink now. 1,080 cases made. —K.M. Roasted plum and sweet cherry flavors feature some black olive notes in this crisp style, with mint and spice on the finish. Kosher. Drink now. 400 cases imported. —K.M. Spicy, with fresh red fruit and tea flavors that are accented by notes of sandalwood. Features dried fig and black olive on the finish. Kosher. Drink now. 250 cases imported. —K.M. A lighter style, with toned-down citrus, green apple, floral and spicy scents, ending on a delicate note. Kosher. Drink now through 2018. 500 cases made. —J.L. Tangy lemon, peach and apple flavors are ripe and juicy, with a smooth body and a lip-smacking finish. Kosher. Drink now. 4,000 cases made. —M.W. Clear, bright, focused and extremely juicy, with plenty of lime, lemon, grapefruit and apple flavors. Kosher. Drink now. 450 cases made. —M.W. The toasted hazelnut, peach and pear flavors are rich and smooth, with a spicy finish and soft acidity. Kosher. Drink now. 1,598 cases made. —M.W. The graceful apple, melon and citrus flavors have an interesting touch of fresh fennel, with spice and a juicy finish. Kosher. Drink now. 600 cases made. —M.W.